The Nobel Prize in Chemistry 2016 was awarded to Jean-Pierre Sauvage, Sir J. Fraser Stoddart and Bernard L. Feringa for their design and production of molecular machines. They have developed molecules with controllable movements, which can perform a task when energy is added. Examples are a tiny lift, artificial muscles and miniscule motors. The first step towards a molecular machine was taken by Jean-Pierre Sauvage in 1983. 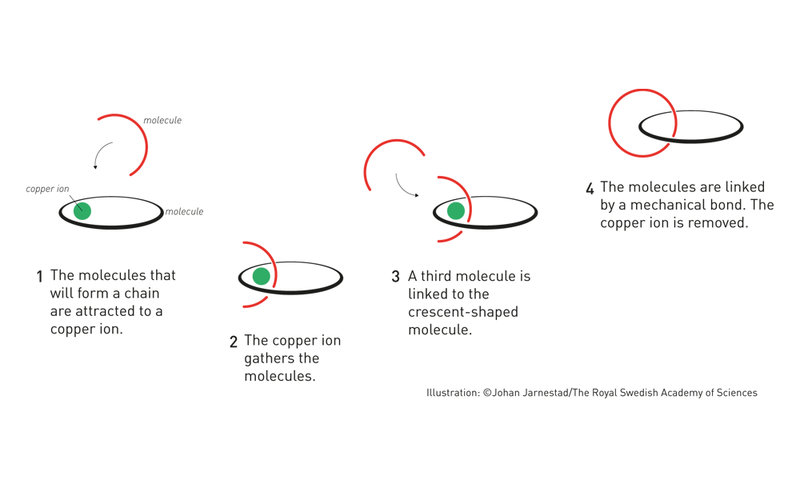 Using an ordinary copper ion, he and his research group in France succeeded in linking two ring-shaped molecules together to form a chain, called a ‘catenane’. Normally molecules are joined by strong bonds in which the atoms share electrons. But in the chain, they were instead linked by a freer mechanical bond. For a machine to be able to perform a task it must consist of parts that can move relative to each other, and the two interlocked rings fulfilled exactly this requirement. Chemists talk about the yield of a reaction: the percentage of the initial molecules that form the target molecule. In previous attempts to create linked molecules, researchers had at best achieved a yield of a few per cent. Thanks to the copper ion, Sauvage was able to increase the yield to an impressive 42 per cent. Suddenly, molecular chains were more than just a curiosity. 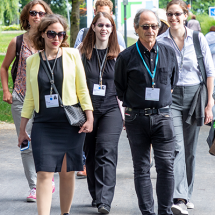 With the help of this revolutionary method, Sauvage reinvigorated the field of topological chemistry, in which researchers – often using metal ions – interlock molecules in increasingly complex structures, from long chains to complicated knots. In 1994, Jean-Pierre Sauvage’s research group also succeeded in producing a catenane in which one ring rotated, in a controlled manner, one revolution around the other ring when energy was added. This was the starting point of the first non-biological molecular machine. The second step towards a molecular machine was produced by a chemist who grew up on a farm without electricity or any modern-day conveniences in Scotland, Sir Fraser Stoddart. In 1991, he developed a ‘rotaxane’. Stoddart threaded a molecular ring onto a thin molecular axle and demonstrated that the ring was able to move along the axle. Among his developments based on rotaxanes are a molecular lift, a molecular muscle and a molecule-based computer chip. 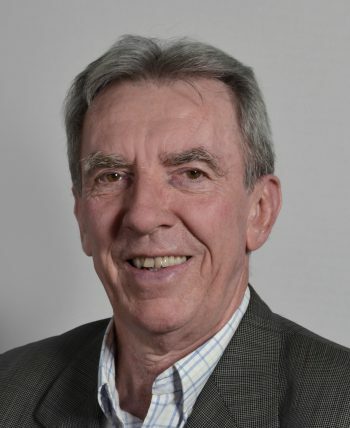 When Fraser Stoddart developed one of the molecular creations, he utilised chemistry’s potential for designing molecules that are att­racted to each other. 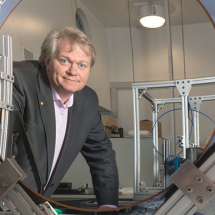 In 1991, his research group built an open ring that lacked electrons, and a long rod, or axle, that had electron-rich structures in two places. When the two molecules met in a solution, electron-poor was attracted to electron-rich, and the ring threaded onto the axle. In the next step, the research group closed the opening in the ring so that it remained on the molecular axle. He had thus, with a high yield, created a rotaxane: a ring-shaped molecule that is mechanically attached to an axle. Fraser Stoddart then made use of the ring’s freedom to move along the axle. When he added heat the ring jumped forwards and backwards – like a tiny shuttle – between the two electron-rich parts of the axle. By 1994, he could completely control this movement, thereby breaking away from the randomness that otherwise governs movements in chemical systems. Since then, Stoddart’s research group has used various rotaxanes to construct numerous molecular machines, including a lift that can raise itself 0.7 nanometres above a surface, and an artificial muscle, where rotaxanes bend a very thin gold lamina. 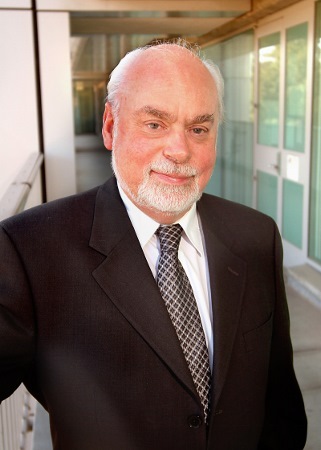 In partnership with other researchers, Fraser Stoddart has also developed a rotaxane-based com­puter chip with a 20 kB memory. The transistors on today’s computer chips are tiny, but gigantic when compared to molecule-based transistors. Researchers believe that molecular computer chips may revolutionise computer technology in the same way that silicon-based transistors once did. When Feringa produced the first molecular motor, he used a number of clever tricks to get it to spin in the same direction. Normally, molecules’ movements are governed by chance; on average, a spinning molecule moves as many times to the right as to the left. But Ben Feringa designed a molecule that was mechanically constructed to spin in a particular direction. The molecule was composed of something that can be likened to two small rotor blades, two flat chemical structures that were joined with a double bond between two carbon atoms. A methyl group was attached to each rotor blade; these, and parts of the rotor blade, worked like ratchets that forced the molecule to keep rotating in the same direction. When the molecule was exposed to a pulse of ultraviolet light, one rotor blade jumped 180 degrees around the central double bond. Then the ratchet moved into position. With the next light pulse, the rotor blade jumped another 180 degrees – round and round in the same direction. The first motor wasn’t exactly fast, but Feringa’s research group has optimised it. In 2014, the motor rotated at a speed of 12 million revs per second. In 2011, the research group also built a four-wheel drive ‘nanocar’; a molecular chassis holds together four motors that function as wheels. When the wheels spin, the car can move forward over a surface. Using molecular motors, Feringa has even been able to rotate a glass cylinder that is 10,000 times bigger than the motor. These groundbreaking steps taken by the three Nobel Laureates have resulted in a chemical toolbox that is used by researchers around the world to build increasingly advanced machines. One of the most striking examples is a molecular robot that can grasp and connect amino acids. This was built in 2013 with a rotaxane as its foundation. Other researchers have connected molecular motors to long polymers, so they form an intricate web. When the molecular motors are exposed to light, they wind the polymers up into a messy bundle. In this way, light energy is stored in the molecules and, if researchers find a technique for retrieving this energy, this would be a new kind of battery. 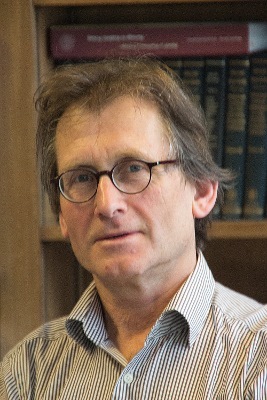 Bernard Feringa said today about possible future applications: “These could be tiny robots that are injected and search for cancer cells or deliver drugs, or novel smart materials.” From energy storage, computing, medical applications to sensors: in a way, the molecular motor is at the same stage as the electric motor was in the 1830s, when scientists displayed various spinning cranks and wheels, unaware that they would lead to washing machines, fans, electric trains, etc. The 2016 Nobel Laureates in Chemistry have taken molecular systems out of equilibrium’s stalemate and into energy-filled states with controlled motion – they have taken chemistry to a new dimension. Bernard Feringa’s four-wheel drive ‘nanocar’: a molecular chassis holds together four motors that function as wheels. When the wheels spin, the car moves forward over a surface.